I was crappie fishing in a Denton, Texas pond with a ultralight 6'5 rod on 6 pound test. I had been catching about 15 fish in an hour for the past couple of weekends fishing a yellow tube on a 1/32 ounce jig head. I had been casting on a submerged tree stump that the fish kept gathering on. After a few crappie and one slab of a bluegill, I made the usual cast to the stump. As I began to retrieve, the reel refused to turn and the pole began to bend. Nothing moved. I tugged harder, but it still wouldn't budge. Right when I was about to clip the line thinking I had snagged the stump, the water exploded and my line peeled off. People began to gather noticing the battle and the trashing of the fish. Was it a catfish? Or perhaps my record crappie I have been fishing for? Then, after 15 minutes of fighting and it stripping line, I realized that it had tired out. So I played it in trying to look like a season pro in front of my audience, but in all reality I was feeling like a giddy school girl. A big old Largemouth Bass. It was a big female about 10-11 pounds. 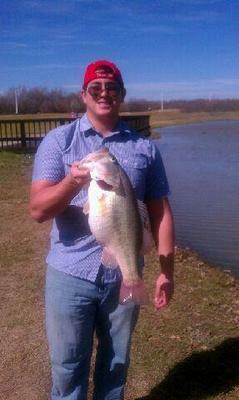 Not very long, but she had the biggest gut I had seen on a bass. Great catch, Kenneth! Good job playing that fish on 6 pound test line long enough to tire her out to be able to land her. I gotta say, even most of those seasoned pros get all giddy, too, when they hook into and catch themselves a big largemouth bass. Even when they try not to, it's hard for them to hide that emotion of knowing they've done something special like that of catching a big fish. I mean, we've all seen those guys on TV, right?... especially Mike Iaconelli. I released the fish so maybe someone else can feel as giddy as I did.